Challenge: Land 17,000 ft of casing in an Appalachian Basin horizontal gas well with a 9,000-ft lateral while maximizing operational and cost efficiencies. Solution: Deploy the new Breakthru™ casing flotation device, which eliminates the need for a debris trap and significantly shortens the shoe track. Results: Landed the casing and accessed 20 ft of additional pay zone, increasing estimated ultimate recovery (EUR) while optimizing drilling and completion costs. Northeast Natural Energy (NNE) wanted to maximize reserves in a horizontal gas well with a 9,000-ft lateral in the Appalachian Basin. Running casing to depth is challenging in long lateral sections because of the excessive drag forces. A casing flotation device is commonly used to reduce this drag by creating an air chamber above the float collar. The buoyant, air-filled lateral section of the casing facilitates a successful outcome by reducing sliding friction by about 50%, while the vertical section of the casing is filled with liquid and provides the weight required to reach TD. a debris catcher that is installed just above the float collar at the end of the string. The casing between the two components extends the length of the lateral and is filled with air. After landing the casing, the ceramic seal is shattered by increasing surface pressure and the large pieces of debris are trapped in the debris catcher. Subsequently, cementing operations can commence. 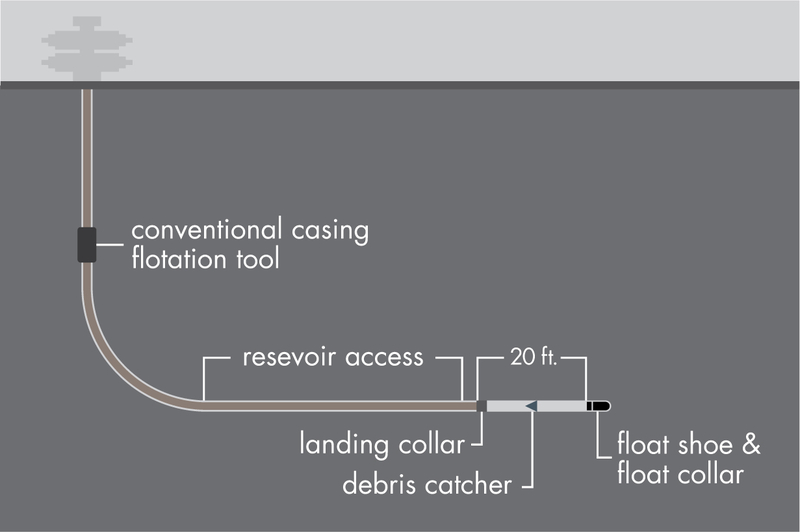 The debris trap requires an additional pup joint and landing collar, and consequently the operator loses a significant interval of pay at the toe of the well or has to drill an extra interval to accommodate these components, thereby increasing costs. NNE turned to Nine to gain a competitive advantage. A conventional casing flotation device prevents access to as much as 20 ft of pay zone at the toe of the well. 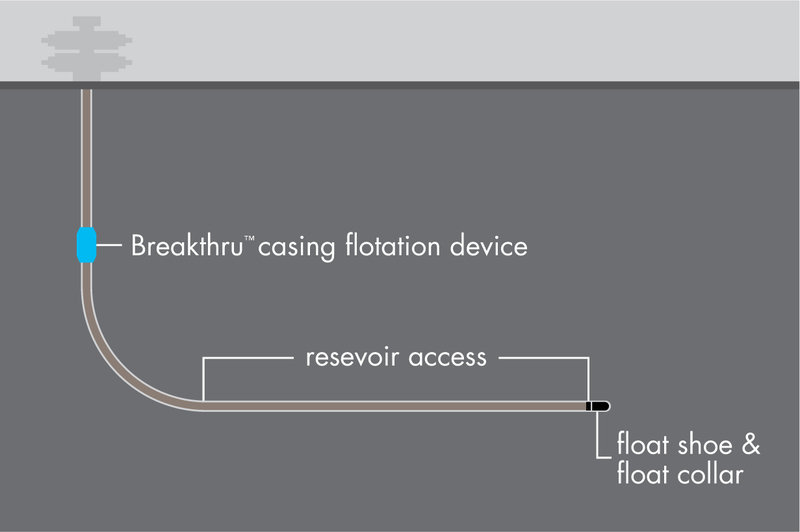 The Breakthru casing flotation device does not require a debris sub and enables production from the entire pay zone. The Breakthru casing flotation device uses an engineered material barrier, integral in a mechanism to shatter at a precise differential pressure. At the activation pressure, the barrier disintegrates into sand-like particles, easily circulated out, leaving a full borecasing string. No debris sub is required. When run in combination with the Nine Energy float shoe, the Breakthru device significantly reduces the weight of the casing in the increasingly longer horizontal sections, reducing the risk of not getting the string to TD. Prejob modeling software determines the position of the Breakthru device in the casing string and pressure activation values. In wells where the tool has been run, there has been 100% success in casing reaching TD. The casing was run seamlessly to depth. By eliminating the debris sub, NNE gained 20 ft of pay without extending the lateral length. At about 2 BCF/1000ft, this represents an estimated incremental gas recovery of USD 120,000 at current gas prices. Eliminating the two premium thread connections required for conventional debris subs lowers costs and further improves well economics.